In June, Conscious Connection introduced our readers to Bedell Guitars, a company dedicated to building some of the finest sounding acoustic guitars in the world from responsibly-sourced tonewoods. This month, we are pleased to present Bedell’s patriotic Homegrown collection. All of the wood for these guitars is sourced from trees grown on American soil, the electronics are American-made, and of course, these beautiful guitars are hand-crafted by American artisans at Bedell’s shop in Bend, Oregon. The Homegrown collection includes three series: the Bedell Earthsong, the Bedell Blackbird Vegan, and the brand-new elite Bedell Wildfire; all three series are available in parlor, orchestra, and dreadnought body shapes. These natural American beauties are created primarily from Alaskan Sitka spruce, Adirondack spruce, and Oregonian bigleaf maple and walnut. 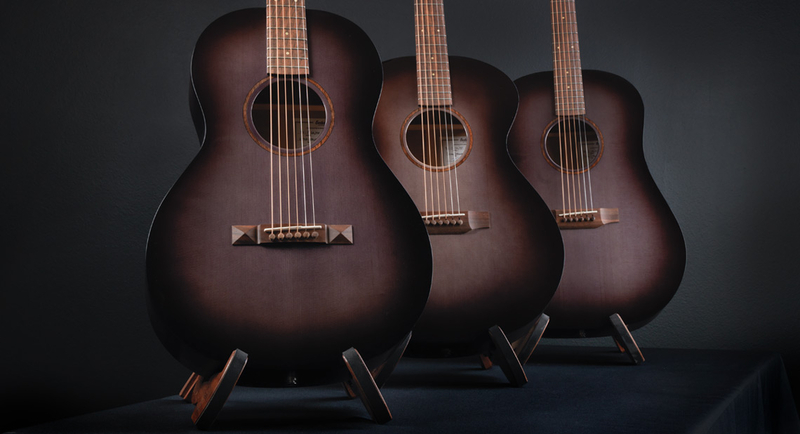 Bedell’s craftsmen have achieved lively, rich, balanced and bold sound in these guitars with their understanding of the unique character and gifts each tonewood delivers. Sitka Spruce: Sitka spruce is used for guitar soundboards because it’s strong and light, and it produces extended harmonic content with strong volume. Bedell’s Sitka spruce is acquired in partnership with Alaska Specialty Wood (ASW). The owner, Brent Cole Sr., and his crew scour the forests of Prince of Wales Island and the surrounding areas for trees that have fallen, are floating in the water, or are being retired from service in a booming ground, bridge structure or floating house. Once salvageable wood is identified, ASW obtains the necessary permits and brings the wood back to their shop in Craig, Alaska for processing and drying. Adirondack Spruce: Adirondack spruce is great for guitar soundboards because it provides a very dynamic tone that has a high ceiling for volume; it is the wood that was used in the “golden era” of American guitar building. Old Standard Wood, owned by John Griffin, specializes in harvesting Adirondack spruce. The company scours the forests for deteriorating or fallen trees, acquires the appropriate permits, and then carefully removes the trees and brings them back to Fulton, Missouri for processing and drying. John is a conservationist at heart, and is committed to the wise use of natural resources. He believes selectively harvesting dead, fallen or nearly dead trees is essential for the health and longevity of our forests. Bigleaf Maple & Walnut: For two decades Cyril Jacob has been rescuing fallen tonewood-quality trees on the coast of Oregon from rotting on the forest floor or being processed into mulch or firewood. Though Cyril got his start with cedar, in the mid ‘90s he branched out into bigleaf maple and walnut, both of which he now provides to Bedell. Cyril believes that every tree holds potential and value, and he makes it his personal mission to ensure that cut and downed trees find their highest purpose. Some of the sweetest guitars in the world would have been flushed were it not for Cyril’s discerning eye and ethic. The Bedell Earthsong Series: The Earthsong series features a Sitka spruce soundboard with bigleaf maple back and sides. Like the entire Homegrown collection, the Earthsong series uses walnut in the fretboard, bridge, and pegboard overlay, whereas the industry typically uses rosewood or ebony sourced from tropical rain forests. Another unique feature of the Earthsong series is its root-beer burst finish. If you’re not daring enough to stray from a mainstream look, the Earthsong is available in a natural finish as well. The Bedell Blackbird Vegan Series: Similar to the Earthsong series, the Bedell Blackbird Vegans (pictured at the very top) are also made with Sitka spruce soundboards, bigleaf maple backs and sides, and walnut features. However, no animal products are used in the creation of this guitar: the bone nut and saddle is replaced with TUSQ man-made ivory, hide glue is not used, and brass dot inlays and position markers are used in lieu of abalone. While TUSQ is manufactured in Canada, this minor compromise to the all-American standard was made in order to be able to deliver a fully-vegan instrument without compromising quality. The Bedell Wildfire Series: On June 17, Bedell guitars released the newest of its instruments – the Bedell Wildfire. Unlike the Earthsong and Blackbird, these elite guitars feature solid Adirondack spruce topwood along with bigleaf maple backs and sides. Bedell craftspeople carefully pair these two American-grown tonewoods to expose the musical gifts each offers, hand-tuning every top and customizing the tone bars for sonic balance, then matching each top to a hand-tuned back. The result is a liveliness that simply must be experienced. What does it mean when a guitar is hand-tuned? Bedell’s luthiers understand that every piece of wood is different in density, color, and shape, so they treat each and every piece of wood that goes into a guitar with its own special care. Bedell’s luthiers build the Wildfire guitars to ensure they project the utmost in harmony and resonance. When the wood is selected, Bedell tests sound frequencies. After each step through the build, sound, pitch, and frequency are tested again. Once each guitar has its bracing placed the sound frequency is tested yet again, and the bracing is hand-shaved until it reaches the perfect pitch. The exquisite appointments and breathtaking Bedell Wildfire gloss finish truly make the Bedell Wildfire guitar look as amazing as it sounds. Without question, the quality delivered by the Wildfire series will help to perpetuate the guitar’s standing as America’s most popular musical instrument.